We arrived in Ahmedabad and then onto a 1 hour car journey to the town where my grandmas house is, along with the rest of our extended family. Our first adventure consisted of what might be an 'illegal' rickshaw ride through Anands 'high street'. I'm not sure if I have seen 7 people fit into a rickshaw before! Its through Planet Travels in Anand where we booked the rest of our itinerary. We would be flying with IndoGo from Ahmedabad to Jaipur, from Jaipur we would have a driver to take us to Agra and then onto Delhi, and from Delhi a flight to Mumbai. This would be the easiest way to make sure we covered everything on our list of sites and attractions. Our second day in was dedicated to travelling to Gondal to scatter my grandads ashes. The day began leaving Anand at 4am on a small coach for a very bumpy 4 hour journey. The destination temple was Akshar Mandir. What a beautiful day it was. Akshardham I cannot describe how amazing Akshardham temple is. Unfortunately you cannot take photos there, so this was the closest I could get one (which does it no justice). The temple took 7,000 craftsmen to build it over 5 years. The detail inside and outside of the temple is remarkable. There are many parts to Akshardham - the temple itself, a walk through animatronics show, a boat ride, a water show and a cinema. I would suggest allowing half a day and going at around 4pm so you can catch the water show in the evening. 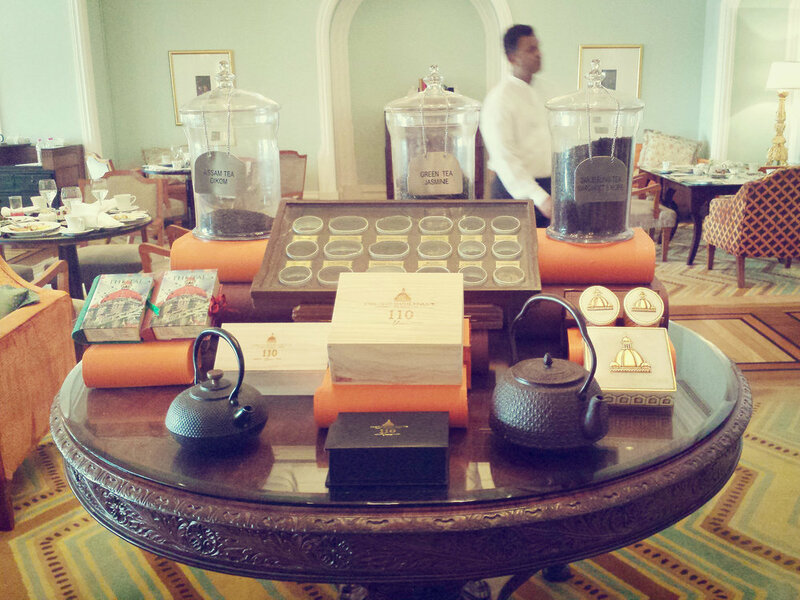 While in Mumbai, we stayed at the The Taj Mahal Palace. We had first heard about this hotel after watching the BBC documentary 'Hotel India'. The documentary went behind the scenes looking at the service they provide, how they treat their guests, the staff and the history of the hotel. I can surely say that the beautiful hotel lives up to its reputation in making their guests feel like royalty. The food would have to be one of my favourite things about india, with the endless amounts of sweet masala chai, rotis and spicy food! If you love biscuits, the brand Parle seem to be very popular there. They do a number of simple milky biscuits which remind me of being at nursery. Milano centre filled cookies were my favourite from the Parle brand. The chocolate cookie being super crumbly and the centre being deliciously gooey! With everything being so cheap, I would suggest bringing back as many boxes as you can! The south Indian Dosa is a thin savoury crepe. The crispy pancake is made from rice batter and black lentils. They can be stuffed with vegetables and come accompanied with chutneys and sauces. Paan is an odd one, you can either love it or hate it. It consists of a betel leaf which can be filled with areca nut, cardamom, saffron, roasted coconut, candied fruit and mukhwas. It is usually eaten after a meal as a digestive. Some paans contain tobacco. I personally quite like the sweet paan but my brother in law thought it was one of the worst things he had tasted! You can find Thalis everywhere in India. They are usually made up of a selection of vegetarian dishes. Some restaurants may serve a meat option too. I opted for the veggie dish here which included rice, dal, papad, roti, yoghurt, potatoes and paneer. Nepalese Momos are one of my favourite street food dishes. They are very similar to Chinese dumplings or Japanese gyoza. I have had momo in London but was keen to try the real deal. After hunting a stall down in Delhi, we got to try these delicious dumplings. Again to be safe we opted for the vegetarian rather than the chicken. Word cannot describe the difference in taste between these and the version I had in London. They were just unbelievable! Served straight from the bamboo steamers, they were sprinkled with salt and pepper and served with an extremely spicy chilli sauce that blew my head off. At 30p for this whole plate, we definitely ordered more for the road! If your in Mumbai, there are two places to head to for a delicious meal, Bademiya and Peshawri. Bademiya are known for their street food stand serving seekh kebabs and super thin rotis. I was amazed by just watching this man making the rotis non stop. If you prefer to sit down and sample their menu, they also have a small restaurant just round the corner. Peshawri can be found at the ITC Maratha in Mumbai. This was recommended to me by my cousin who regularly visits Mumbai. The way he had described the Sikandari Raan and the Dal Bukhara, we simply could not miss out on having this. The Sikandari Raan is a whole leg of lamb, braised in a marinade of malt vinegar, cinnamon and black cumin and finished in a Tandoor. With the lamb falling straight of the bone and taste of all the spices, this dish is to die for! I would recomend sharing for 3 people and ordering one more dish along with some roti. We chose the Dal Bukhara, a black lentil dal simmered overnight with tomatoes, ginger and garlic. As my cousin puts it, 'it tastes like the dew from gods forehead'! I'm sure I can speak for all of us that went on this trip and say what an amazing time we had! With all its different smells, amazing sites and great food, I cant wait to go back and visit the south of India now.